"Then I saw, and look! the Lamb standing on Mount Zion, and with him 144,000 who have his name and the name of his Father written on their foreheads"
Jesus Christ taught the heavenly resurrection several times, and especially on the evening of the last Passover he celebrated with his Apostles: “Do not let your hearts be troubled. Exercise faith in God; exercise faith also in me. In the house of my Father are many dwelling places. Otherwise, I would have told you, for I am going my way to prepare a place for you. Also, if I go my way and prepare a place for you, I will come again and will receive you home to myself, so that where I am you also may be. And where I am going, you know the way” (John 14:1-3). During this last celebration, he made a covenant for a kingdom (different from the new covenant): “However, you are the ones who have stuck with me in my trials; and I make a covenant with you, just as my Father has made a covenant with me, for a kingdom, so that you may eat and drink at my table in my Kingdom, and sit on thrones to judge the 12 tribes of Israel” (Luke 22:28-30). Jesus Christ told to his faithful apostles that they would reign with him in the heaven, to rule over the earth where the future humanity will be the "Twelve Tribes of Israel" (see Matthew 19:28). 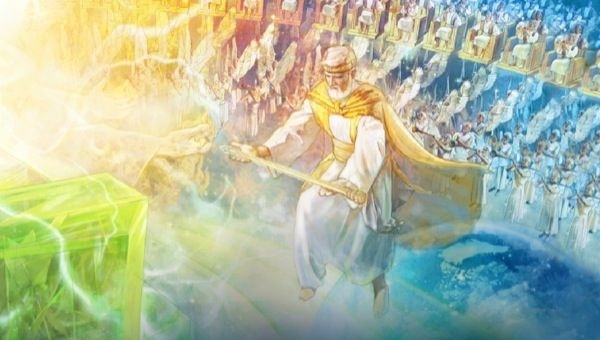 This idea that humans who will have the privilege of living in heaven, will rule over the Earth, is written in the book of Revelation: “you made them to be a kingdom and priests to our God, and they are to rule as kings over the earth” (Revelation 5:10). Nevertheless, the book of Revelation repeatedly shows that the number of those who will live in heaven will be only 144,000, taken the humanity: “Then I saw, and look! the Lamb standing on Mount Zion, and with him 144,000 who have his name and the name of his Father written on their foreheads” (Revelation 14:1-5). The context of the book of Revelation confirms that it is a literal and not a symbolic number. For example, this number is found for the first time in Revelation 7: 4-8: “And I heard the number of those who were sealed, 144,000, sealed out of every tribe of the sons of Israel” (Revelation 7:4-8). And the context of this important information makes us understand that this is a real and not a symbolic number. Indeed, after Revelation 7: 4-8, the prophecy continues in verses 7: 9-17 describing the great crowd that will survive the great tribulation. This time, regarding this group, the prophecy gives this detail: “After this I saw, and look! a great crowd, which no man was able to number, out of all nations and tribes and peoples and tongues, standing before the throne and before the Lamb, dressed in white robes; and there were palm branches in their hands” (Revelation 7:9). A “great crowd which no man was able to number” in this case the number of people is not known. We therefore understand that the information before, regarding the precise number of 144,000 humans who will live in heaven is to be taken literally. It is written in The book of Revelation that 7000 humans will complete the 144000 in the heavens just before the Great Tribulation: “In that hour there was a great earthquake, and a tenth of the city fell; and 7,000 persons were killed by the earthquake, and the rest became frightened and gave glory to the God of heaven” (Revelation 11:13). The "tenth of the city" that falls, represents all of the 144,000 who died on earth to live in heaven, while the 7,000 people "killed" (just before the great tribulation) represent those who will complete the 144000, with their heavenly resurrection: “Afterward we the living who are surviving will, together with them, be caught away in clouds to meet the Lord in the air; and thus we will always be with the Lord” (1 Thessalonians 4:17). This group of humans will be the New Jerusalem, the Bride of Christ: “And I saw a new heaven and a new earth; for the former heaven and the former earth had passed away, and the sea is no more. 2 I also saw the holy city, New Jerusalem, coming down out of heaven from God and prepared as a bride adorned for her husband. 3 With that I heard a loud voice from the throne say: “Look! The tent of God is with mankind, and he will reside with them, and they will be his people. And God himself will be with them. 4 And he will wipe out every tear from their eyes, and death will be no more, neither will mourning nor outcry nor pain be anymore. The former things have passed away”" (Revelation 21 :1-4). "Praise Jah, because Jehovah our God, the Almighty, has begun to rule as king! Let us rejoice and be overjoyed and give him glory, because the marriage of the Lamb has arrived and his wife has prepared herself"
“And I heard what sounded like a voice of a great crowd and like the sound of many waters and like the sound of heavy thunders. They said: “Praise Jah, because Jehovah our God, the Almighty, has begun to rule as king! Let us rejoice and be overjoyed and give him glory, because the marriage of the Lamb has arrived and his wife has prepared herself. Yes, it has been granted to her to be clothed with bright, clean, fine linen—for the fine linen stands for the righteous acts of the holy ones” (Revelation 19:6-8). This heavenly marriage is also described in Psalm 45, which gives additional information about the earthly "children" as the result of this marriage: “Your sons will take the place of your forefathers. You will appoint them as princes in all the earth” (Psalms 45:16). These earthly princes who rule over all the earth, will be the earthly representatives of the royal authority of Christ and the 144000 (New Jerusalem), that is to say, of the Kingdom of God: “Look! A king will reign for righteousness, And princes will rule for justice. And each one will be like a hiding place from the wind, A place of concealment from the rainstorm, Like streams of water in a waterless land, Like the shadow of a massive crag in a parched land” (Isaiah 32:1,2). In the prophecy of Ezekiel, these "princes" are designated by the function of the "chieftain": “However, the chieftain will sit in it to eat bread before Jehovah, for he is a chieftain. He will come in through the porch of the gate, and he will go out through it” (Ezekiel 44:3). According to Revelation 5:10, the 144,000, the New Jerusalem, and the King Jesus Christ, will accumulate the function of heavenly kings and priests for the inhabitants of the earth. This will not be the case of earthly princes. If the princes will be earthly representatives of Celestial Kingship, they will not be the earthly priests. These future earthly priests will represent the heavenly priesthood of the 144,000, as the earthly "Sons of Zadok": “The dining room that faces north is for the priests who are responsible for the service of the altar. They are the sons of Zaʹdok, those from the Levites who are assigned to approach Jehovah to minister to him” (Ezekiel 40:46). Why the expression "Son of Zadok"? Because the priest Zadok supported King David at the risk of his own life while his son Absalon usurped his throne (2 Samuel 15: 23-37, chapters 16-18). In addition, the priest Zadok supported David's decision to appoint his son Solomon as successor, unlike Abiathar. Therefore, he did not participate in the second attempt to usurp the throne, this time by another son of David, Adoniya (1 Kings 1: 5-53). Abiathar was removed from office as a priest while Zadoc was privileged to assume the high office of high priest (1 Kings 2: 26,27). Since 1914 the heavenly Kingship of Christ has been dangerously challenged on Earth (Psalms 2). Nevertheless, in the past as now, many courageous Christians support the heavenly kingship of Christ at the risk of their own life. It is among these faithful Christians that Jehovah God will be named as the "Sons of Zadok" and as future earthly priests. Jehovah God prophetically and kindly talk about the "Son of Zadok": “‘As for the Levitical priests, the sons of Zaʹdok, who took care of the responsibilities of my sanctuary when the Israelites strayed from me, they will approach me to minister to me, and they will stand before me to offer me the fat and the blood,’ declares the Sovereign Lord Jehovah. ‘They are the ones who will enter my sanctuary, and they will approach my table to minister to me, and they will take care of their responsibilities to me (…) And this will be their inheritance: I am their inheritance. You should not give them any possession in Israel, for I am their possession” (Ezekiel 44:15,16,28).